Bharti Enterprises Vice-Chairman Rakesh Bharti Mittal has been appointed as the new President of CII (Confederation of Indian Industry) for the year 2018-19. He has succeeded Shobana Kamineni, Executive Vice Chairperson, Apollo Hospitals Enterprise Ltd.
Uday Kotak, Founder and CEO of Kotak Mahindra Bank took over as President-Designate of CII for 2018-19, whereas Vikram Kirloskar is the new Vice-President of CII for the current fiscal. Vikram Kirloskar is the Chairman and Managing Director of Kirloskar Systems. 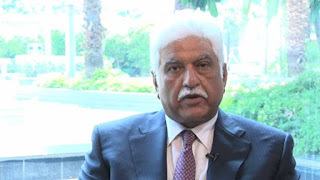 Rakesh Mittal is also the Chairman of Bharti AXA Life Insurance, Bharti AXA General Insurance, FieldFresh Foods and Centum Learning as well as a Board member of Bharti Airtel and MD of Bharti Realty Holdings, CII. He also served as member, India-Pakistan Joint Business Forum (IPJBF) and several Government Committees and Governing Councils of Institutions of Excellence like ICAR. He had been elected as a member of the National Council of CII several times since 1999. It is a business association in India which was founded 123 years ago in 1895. It is a non-government, not-for-profit, industry-led and industry-managed organization which works with the Government on policy issues. It has over 8,300 members, from the private as well as public sectors, including SMEs and MNCs and an indirect membership of over 200,000 enterprises. Its headquarter is located in New Delhi. CII works to create and sustain an environment conducive to the development of India, partnering industry, Government, and civil society, through advisory and consultative processes. Who has been appointed as the new President of CII (Confederation of Indian Industry) for the year 2018-19?